Can You Die from a Codeine Overdose? If you or someone you know is experiencing codeine overdose symptoms, call 911 immediately. While waiting for the paramedics to arrive, remain with the person who has overdosed and monitor their symptoms. Keep talking to him or her to keep the person conscious. If the person is vomiting, keep him or her sitting up or lying on the side to help avoid choking on stomach contents. 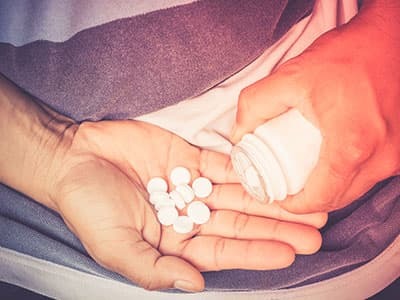 Inexperience or lack of knowledge: A lack of knowledge of the drug’s effects on the body when too much is ingested may result in someone overdosing on codeine. For example, a person may take far more than the prescribed dose to get high. Or if someone has been prescribed medication containing codeine but is still feeling pain, he or she may take more than the prescribed dose. Additionally, taking codeine medication more frequently than directed can also lead to an accidental overdose. Tolerance: Regular use of opioids such as codeine can lead to tolerance, meaning that the effect of the substance decreases over time with frequency of use.7,8 In addition, long-term codeine use can also result in a condition known as hyperalgesia, which is an increase in pain sensitivity.8 A person taking codeine to alleviate pain from surgery or an injury may become increasingly sensitive to all kinds of pain, and begin taking more codeine to compensate. As tolerance increases, the person begins to take higher and higher doses, and places himself or herself at increased risk of overdose. Relapse: Another potential for overdose comes from tolerance and relapse. For example, someone who abuses codeine for an extended period of time may begin a treatment program and safely withdraw from the drug during detox. During that time, and throughout any abstinence period, tolerance levels begin to decrease. Upon completion of the program, the person may relapse. The person may use the same or a similar amount to what he or she had been using before. However, this amount is now significantly greater than his or her body can endure, and the person overdoses as a result. Who Answers? to speak to a recovery support specialist about addiction treatment centers. If you or someone you know has overdosed on codeine, call 911 immediately. If calling is not an option, take the overdosed person to the emergency room at a hospital. An emergency room will be equipped to treat codeine poisoning, whereas a walk-in clinic may not. Activated charcoal to absorb any codeine still in the stomach. Other medications such as naloxone designed to counteract the drug’s effects. A laxative to counteract codeine’s constipation effect and to aid in flushing the drug out of the body. Breathing support, such as a breathing tube connected to a ventilator. As mentioned previously, one of the main effects of codeine is shallow or labored breathing. If an overdose of codeine occurs, a person may experience such difficulty breathing that it may lead to unconsciousness. The lack of oxygen can cause damage to the brain, heart, lungs, and other vital organs. If codeine is present at high enough levels, the resulting respiratory depression can be fatal. Studies have established that an average lethal dose of codeine is 800 mg. 2 What this means is that roughly 50% of people who take 800 mg in one sitting are at risk of dying. However, this doesn’t mean that people can’t overdose – and die – at much smaller doses. As with any poisoning, time is critical. The faster someone receives treatment, the more likely he or she is to recover from a codeine overdose. However, people who experience an overdose may have a substance abuse problem. If this is the case, they should seek help at a rehab center to address possible addiction and prevent any future overdose. Many treatment centers offer a variety of options to help a person recover from an overdose or addiction. Inpatient rehab centers may offer detoxification under the care of doctors and medical staff to ensure a safe and medically stable withdrawal from codeine abuse. These programs also offer other services for overdose recovery such as therapy, relapse prevention training, holistic treatments, and preparation for follow-up care after discharge. Outpatient programs provide medical support and mental health services to create a healthy and safe environment for a person to begin recovery. These programs are offered on a part-time basis and vary in terms of frequency and time commitment. 12-step programs bring together people who have substance abuse or dependence problems in a setting where they can work on their problems and support one another. There are many more 12-step programs than just Alcoholics Anonymous. Narcotics Anonymous and Pills Anonymous are also available in most urban areas. If you or someone you know is addicted to codeine or any other substance, please seek help now. You can call our helpline at 1-888-319-2606 Who Answers? to receive assistance finding an overdose or addiction recovery center.
. Substance Abuse and Mental Health Services Administration (SAMHSA). (2015). Emergency Department Visits Involving Narcotic Pain Relievers.
. World Health Organization (2016) Basic Analytical Toxicology Monographs analytical and toxicological data 6.33 Codeine.
. National Library of Medicine MedlinePlus (2015) Codeine Overdose.
. U.S. Food and Drug Administration (2013) Codeine Sulfate Oral Solution.
. University Health Service (2016) The Effects of Combining Alcohol with Other Drugs.
. National Center for Biotechnology Information (2012) Polydrug abuse: A review of opioid and benzodiazepine use.
. National Center for Biotechnology Information (2011) Analysis of opioid efficacy, tolerance, addiction and dependence from cell culture to human.
. National Center for Biotechnology Information (2007) Mechanisms for opioid-induced tolerance and hyperalgesia.
. National Library of Medicine MedlinePlus (2015) Acetaminophen and codeine overdose.
. Romach MK, Sproule BA, Sellers EM, Somer G, Busto UE (1999) Long-term codeine use is associated with depressive symptoms. Journal of Clinical Psychopharmacology, 19 (4), 373-376.